If you have pretty desserts you wish to display, or glasses and bottles to exhibit at a bar, this stunning wooden stand is perfect. 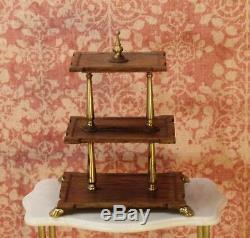 This 3-tier display tray was made by. 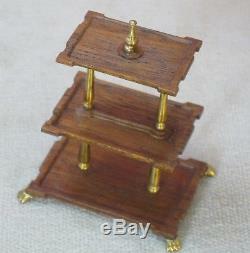 This piece consists of 3 wooden trays, gradating from largest on the bottom to smallest on top. 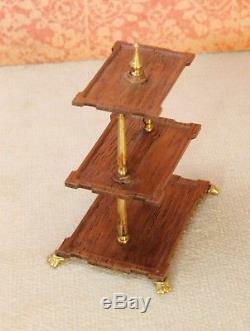 Each tray is beautifully shaped and carved to form pretty edging. 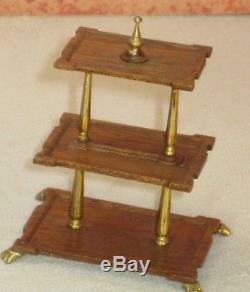 The bottom tray sits on 4 cute little brass feet. 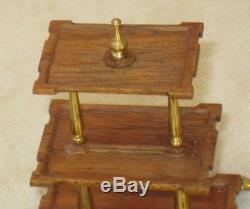 The two lower trays are each held apart by 2 very nice brass uprights. 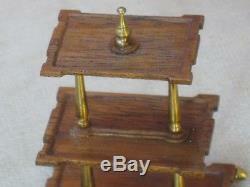 Then on the top tray, there is a pretty little brass finial. 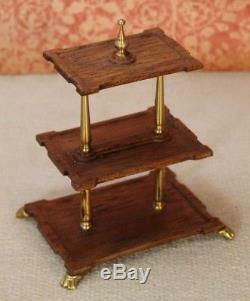 This is probably designed to be a dessert display tray, perfect for a formal dining room, or a restaurant or tea room. You could place cake slices, cookies, and pastries on each level. 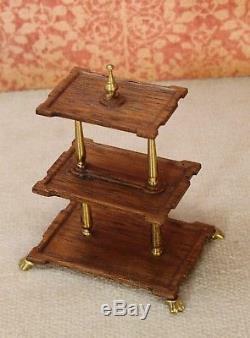 I believe it can also be used to display glasses (on the lower shelves) and bottles (on the top shelf) for a bar. It is signed on the bottom with the Taller Targioin mark, tT. This is a unique piece by Alvaro, not easy to find, and so elegant! 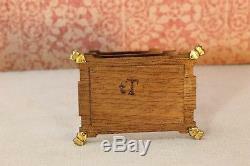 2¼" H x 1 13/16 " W x 1 D. Is a handcrafted Vintage piece. Because of its age, this item is not considered NEW. However, it has only been used in a display setting, and has not undergone any wear & tear. Any questions, please message me. If item is damaged in transit, please send me digital photos of condition. Please give me the chance to resolve any issues first, before leaving feedback. Please refer to the photos for exact condition and see close-ups for details. 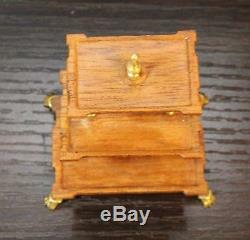 If an item has notable damage or repair, it will be discussed in the item description and shown in the photos. It is, however, possible, that items may have minor imperfections that simply come with working in the world of miniatures. 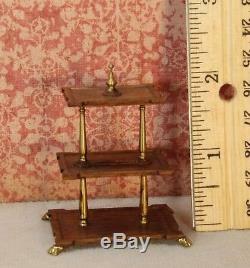 The item "Taller Targioni 3-Tier Dessert Serving Tray Stand Artisan Dollhouse Miniature" is in sale since Thursday, December 20, 2018. 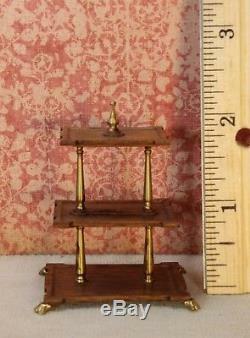 This item is in the category "Dolls & Bears\Dollhouse Miniatures\Home Décor". The seller is "singndanz77" and is located in Hightstown, New Jersey. This item can be shipped to United States, Canada, United Kingdom, Denmark, Romania, Slovakia, Bulgaria, Czech republic, Finland, Hungary, Latvia, Lithuania, Malta, Estonia, Australia, Greece, Portugal, Cyprus, Slovenia, Japan, China, Sweden, South Korea, Indonesia, Taiwan, Thailand, Belgium, France, Hong Kong, Ireland, Netherlands, Poland, Spain, Italy, Germany, Austria, Bahamas, Israel, Mexico, New Zealand, Philippines, Singapore, Switzerland, Norway, Saudi arabia, Ukraine, United arab emirates, Qatar, Kuwait, Bahrain, Croatia, Malaysia, Chile, Colombia, Costa rica, Dominican republic, Panama, Trinidad and tobago, Guatemala, El salvador, Honduras, Jamaica.